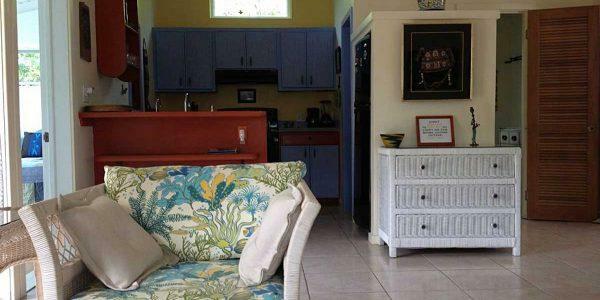 Fiddlewood Cottage is an affordable breezy, very private, one bedroom (with AC), fully equipped, home on the undeveloped, quiet side of St. John, nestled within the Virgin Islands National Park. 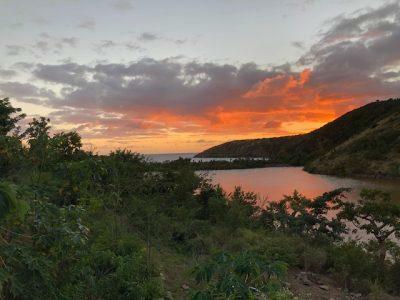 It is located a short distance from the end of the bus line at Saltpond Bay, above Mandahl Pond, with walking distance to Grootpan, Kiddel, Saltpond and Lameshur beaches. No other homes or lights in view. Mature gardens, with large shade trees. A peace filled sanctuary where all creatures find comfort. Except mosquitoes!!! 8 minute drive to Coral Bay for groceries, shopping and restaurants. Dish soaps, paper towels, toilet paper, all kitchen supplies, bath & beach towels, beach chairs, swim fins (masks not provided), outdoor gas grill, full size kitchen and drinking water is separately filtered at the kitchen sink. 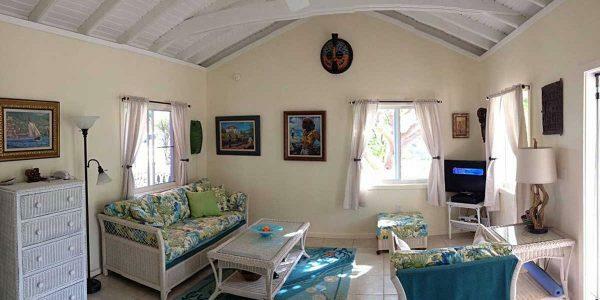 In addition to the great breezes, there are ceiling fans in every room with AC in the bedroom only. Fiddlewood’s bedroom has a queen size bed, a queen pull out couch in the living room plus a single sleeping settee on the screened in porch overlooking Mandahl Pond’s amazing bird life. 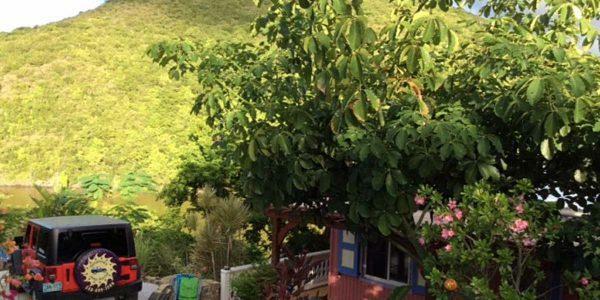 Affordable for those who loved camping at Maho Bay, Cinnamon Bay, or Concordia but want to upgrade with more privacy, comfort and easy access. Off road parking right to the front door. 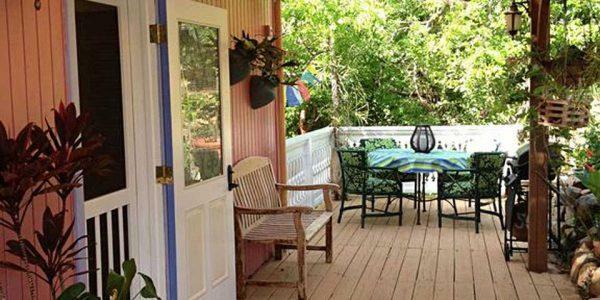 Dining on both the front and back decks with fresh herbs growing in the front deck garden. WIFI provided and cell phone works best using WIFI mode. Breezy with living room that opens to screened in porch above Mandahl Pond for lounging & great bird watching. 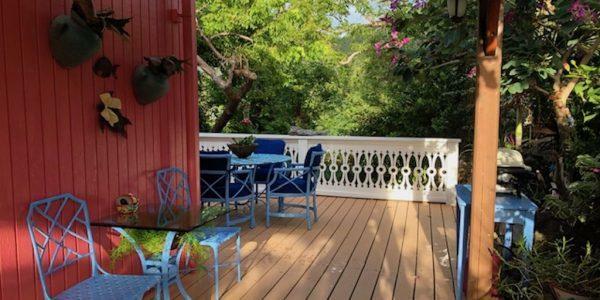 Deck with 2 Adirondack chairs for shaded morning coffee, sunset views to Grootpan Bay pwith the distant sounds of crashing waves & star filled skies devoid of light pollution. Dining inside on porch and outside in the garden. A perfect place for retreats, honeymoons & nature filled getaways. The light is always changing, magic and a plein air painters dream! We have been clearing a flat space below the cottage, planting more medicinal and edible herbs , trees and grasses. This space can be used for intimate weddings, celebrations of life, plant ceremonies or grounding within your yoga practices. 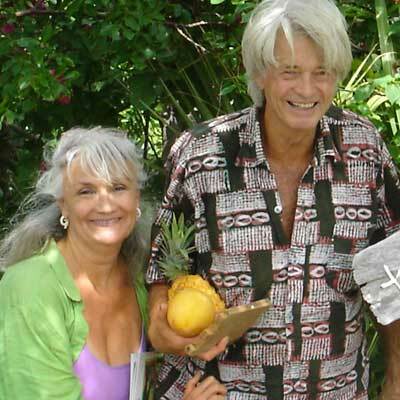 Affordable, quiet, peaceful, comfortable, unpretentious living in the Caribbean is what we offer to the traveler who wants to get away far, far from the maddening crowds. Please contact us regarding availability, reservations, questions and deposit. Rates are subject to change without notice. We advise always renting cars on St. John as the barges are not reliable. Also economy cars that are low to the ground cannot clear the top of the driveway. We appreciate that you use our personal payment options and communicate directly with us. We are 40 + year full time residents of St. John and Fiddlewood Cottage will become our retirement home when we can no longer negotiate our 50 steps to our current home in East End. We are both artists and..